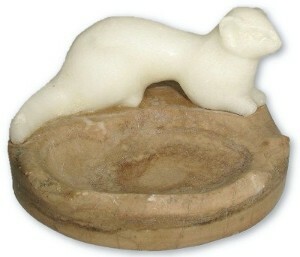 Art deco alabaster white mink figural ashtray. 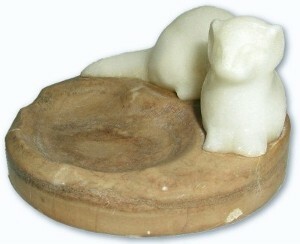 This item has the most whimsical and downright beautiful figure of a white mink sitting on the rim of a mottle brown marble ashtray. 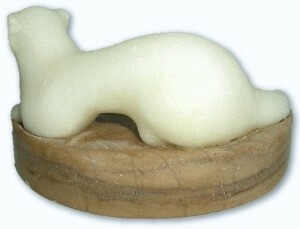 Measures @ 4" X 2 1/4" some very minor roughness to the ears and top of tail and a few marks on the side of the base. No other condition issues other than about 100 years of use wear. 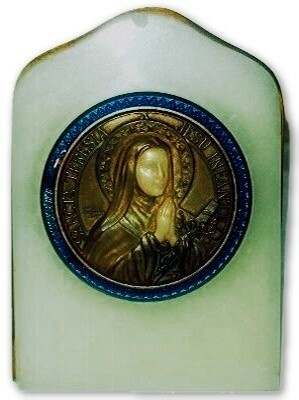 Antique French brass and mother of pearl holy water font. The hinged doors open to reveal the relief figure of the Virgin Mary upon a very dark crushed velvet ground. 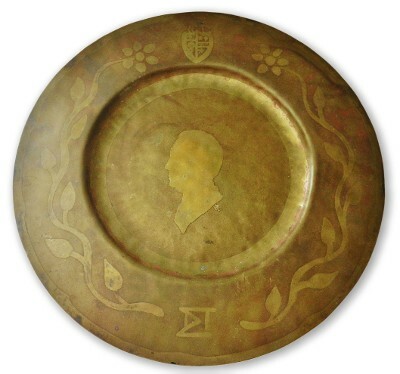 This back is mounted onto a piece of wood and is loosely held into the original brass and mother of pearl frame. May be hung by a brass ring attached to the cross atop the frame. Measures 6 1/2" X 2 3/4" and when the doors are opened, 5 1/4" across. No apparent damage, normal age wear and patina. 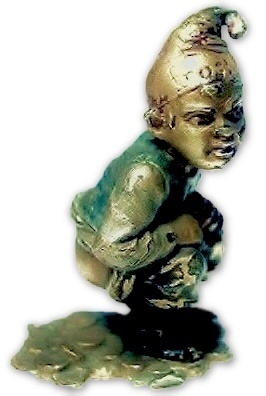 Outstanding BERGMAN Austrian bronze miniature figure of a devilish LEPRECHAUN & his POT-OF-GOLD marked PROST on his hat! Oh how fanciful and devilish is this little fellow? 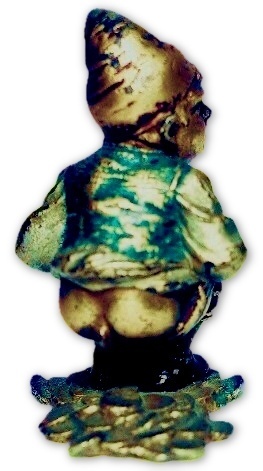 A cold painted bronze (some normal paint loss as seen in images), with his pants pulled down, creating his famous POT-OF-GOLD! This gem squats just 2" tall. What a naughty fellow he is. 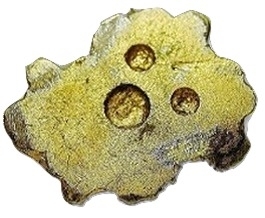 Two coins on the edge of the base appear to be slightly bent. 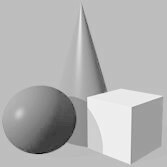 One has a small stress line associated to the bend. This item is signed PROST on the front of his hat and it appears that the faint impression of the Bergman foundry mark is on one coin guaranteed to be old and original! 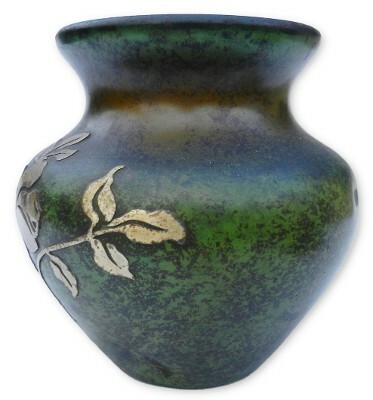 Heintz Art Verdigris finish "Sterling on Bronze" arts and crafts vase. Marked on the base with the company logo, Sterling on Bronze, Pat Aug 27,12. 3817B. Measures 5 1/2" X 5 1/4". 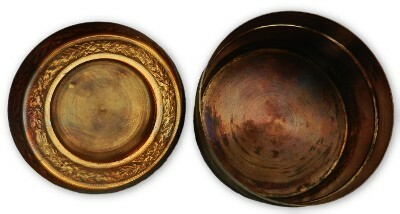 Normal use wear along with seveeral small dings and associated patina loss. Original and unpolished condition. Interior wear. No other damage or repairs. RAYMOND TSCHUDIN (French 1916-1998) artist signed relief bronze, carved ivory, blue enamel on light green onyx plaque. 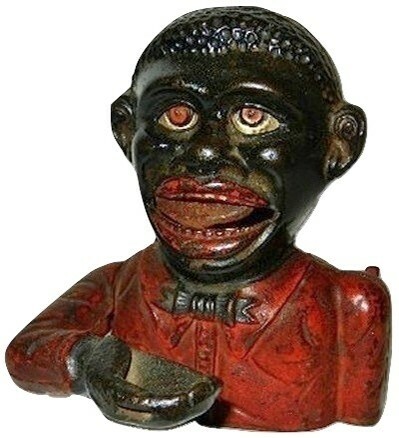 Exceptionally detailed with exquisite carved face and hands. Overall measurements are 4 1/2" X 3 1/4" X 1/2" deep. 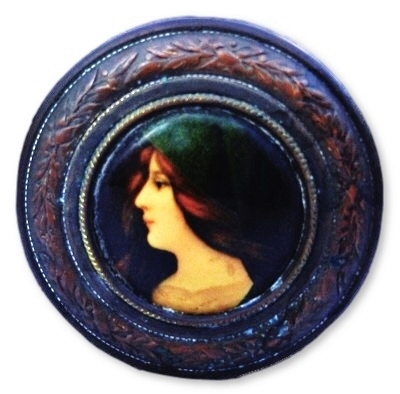 The bronze relief portrait of Saint Teresa is covered in a rich, dark brown patina with no wear. The ivory hands and face are crisp and clean. 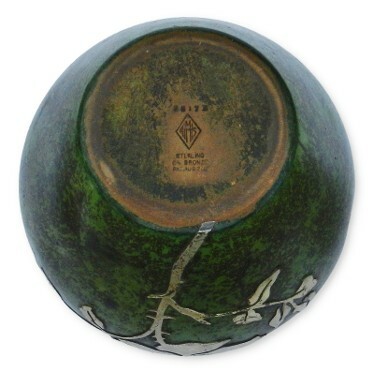 There is some minor flaking to the enamel work to the left of the artist signature Tschubin, as well as a small flat flake at the top of the pale green onyx body. The reverse side is also mounted with its original bronze backing and easel stand. Raymond Tschubin is a well documented and listed French sculpture artist. 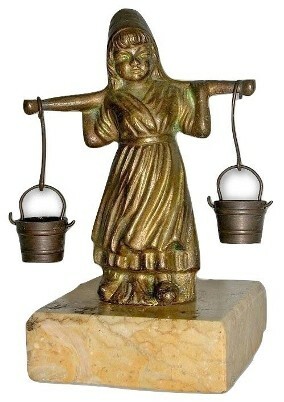 Antique bronze milk maiden. 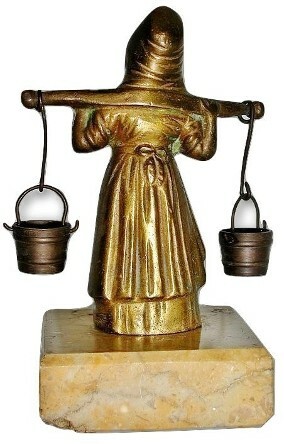 This lovely figure is of a milk maiden with an ox yoke across her shoulders from which hang two suspended buckets. 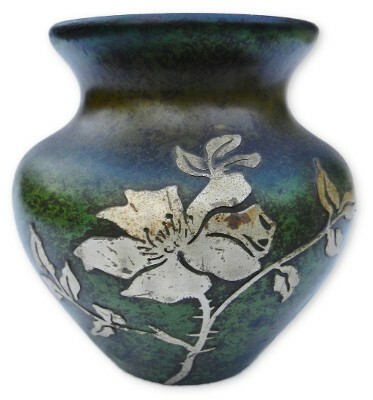 This item is absolutely an antique bronze and has its original marble base. There is a bottom back corner chip to the marble and a couple of very small flakes (to the marble only) as you can see in the image, but mostly to the back and a few flakes to the side edge, nothing to distract from its overall display. 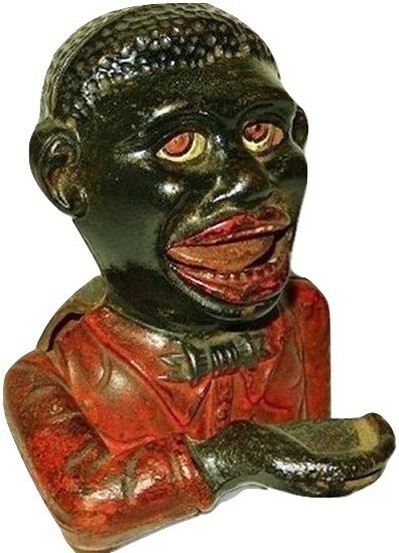 This item was most likely produced in Austria circa 1900 and stands 4 1/2" tall. No repairs and original light gold cold paint and patina. 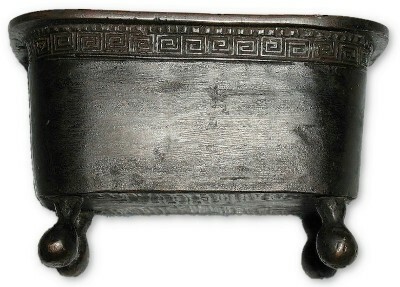 Antique hand crafted Greek Key pattern decorated 4 footed tub shaped dish. 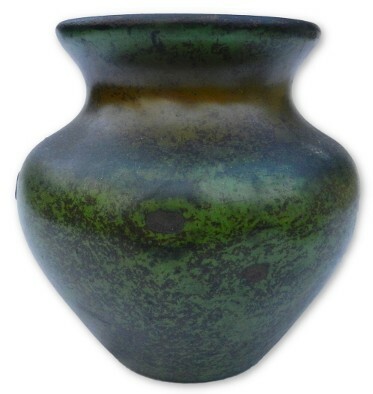 Beautiful original dark bronze patina. Measures 4 1/4" X 2 7/8" X 2 1/2" No makers marks. No damage or repairs. TIFFANY STUDIOS 988 gold dore' finish bronze ZODIAC desk set blotter ends. Original matched pair measures 19 1/4 X 2" X 5/16". No damage or repairs. 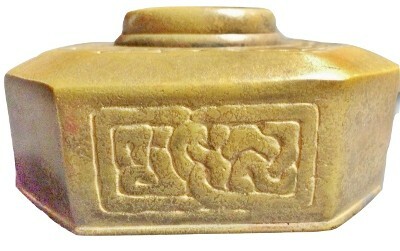 Tiffany Studios Inkwell Gold Dore' finish over bronze Zodiac pattern. Measures 4" X 4" X 2". Impressed; "Tiffany Studios New York 842". No glass insert, some normal use wear. No damage or repairs. 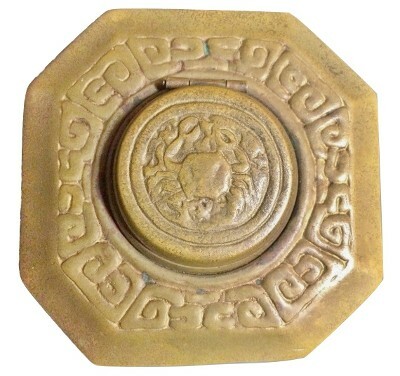 TIFFANY STUDIOS original Bronze finish ZODIAC pattern desk set pen tray. Measures 10 1/8" X 3 3/8" X 3/8". A few dark spots in the finish very minor normal age wear, no scratches or repairs. 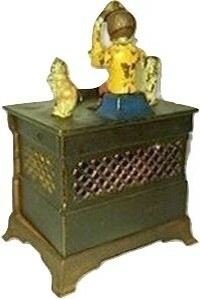 Antique J. E. STEVENS CABIN BANK. 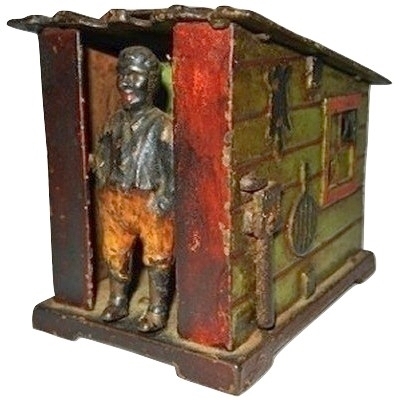 A wonderful original example of antique black Americana The Cabin Bank exhibits an African American man in the front doorway of a small cabin. 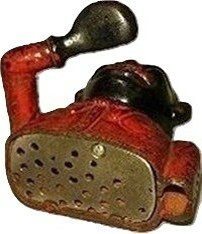 When you pull the broom on the side the man flips feet up toward the roof, kicking the coin on the roof into the slot. This is the dark green with red trim version. 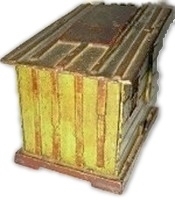 An example of the Cabin Bank is shown in "The Bank Book, The Encyclopedia of Mechanical Bank Collecting" by Bill Norman on page 76 and as number 1610-b, CABIN BANK. The base is impressed Pat'D June 20 1885 while the original trap is dated Pat Feb 2, 1875. Measures @ 4 1/2" X 3 3/4" X 3". Bank is in excellent working condition. 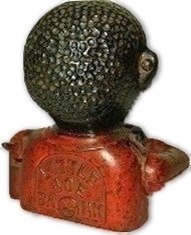 Antique original JOHN HARPER CO. ENGLAND "LITTLE JOE" CAST IRON MECHANICAL BANK. Measures @ 5 1/2" X 5" X 4 1/2". 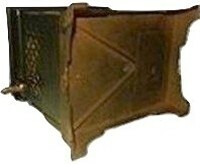 The reverse side of the bank reads; "LITTLE JOE BANK". A red shirt, black bow tie with brown eyes, all original paint in very good untouched condition. 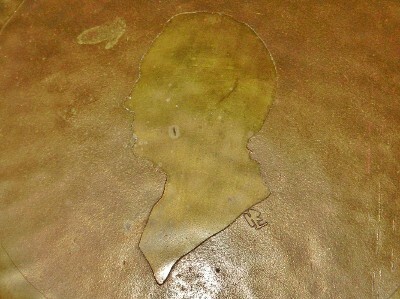 Has a 1/2" X 1/2" loss to the cast iron on the top of his shoulder as seen in our image. When you place a coin in Little Joe's hand, press his lever, his arm raises, tongue moves back in his mouth, eyes roll back into his head and the coin disappears magically into Little Joe's open mouth. One screw on the underside appears to possibly be an old replacement, the back screw is original and still retains the original red paint. Excellent working condition. No other damage or repairs and expected light wear to the original painted finish. Antique original KAYSER & REX "ORGAN BANK" cast iron mechanical bank. 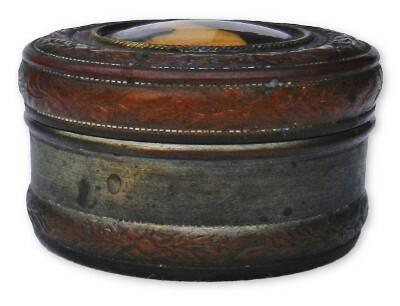 Wonderful example is in original working condition and the original untouched painted finish. 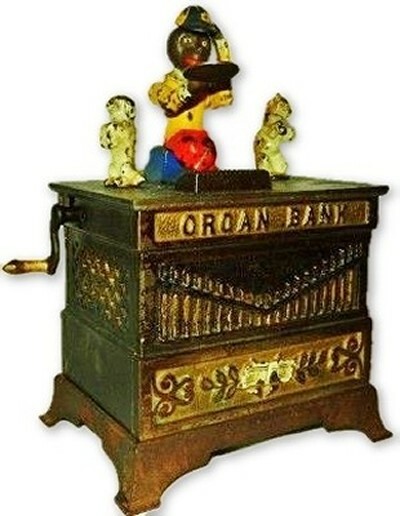 When the organ's handle is cranked, the white cat and dog dance in circles while the monkey tips his striped cap and a coin which was placed on the monkeys tray is dropped into the slot atop the "Organ Bank" all while a bell rings inside the bank. 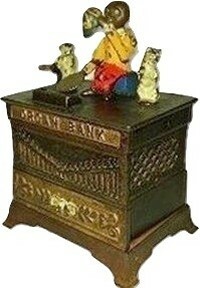 The bank has what appears to be a small in the making foundry flaw at the top between the cat and the monkey though it does not appear to go beyond the very surface of the banks top. 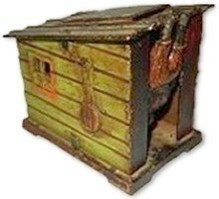 Retains its original trap on the bottom though we do not possess the single stroke key. Measures @ 7 1/2" X 6" X 4 1/8". Impressed "Pat June 13 1882". 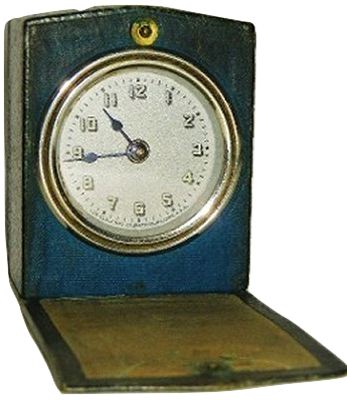 Vintage and all original blue leather & chrome "LUX CLOCK MFG. CO WATERBURY CONN USA.". Marked on the face edge with a nice clean silver face and Art Deco style numbers. 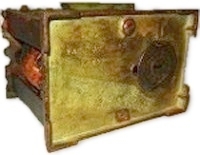 The front and back, open, and close with a blue leather covered matching flap and snap closed with a small brass snap both front and back. This item appears to keep very good time. This is not an alarm clock yet it is indeed a pocket sized. Measures 3 1/2" X 2 3/4" X 1 3/4". The interior flaps are lined with tan silk fabric which along with the leather case shows light age use wear. This item is in very good condition. No repairs and an original art deco period Lux travel clock. 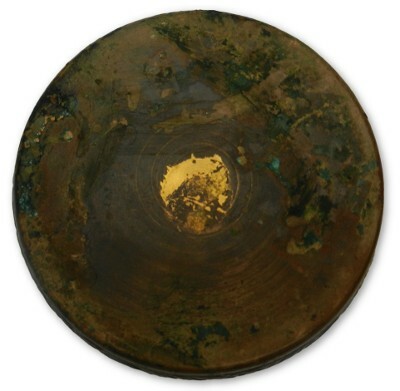 Unusual hand hammered Copper Arts & Crafts portrait charger. The center has a raised silhouette of a gentlemans torso while the boarder displays raised vines and flowers. A Monogram is raised at the 6:00 position and a coat of arms is raised at the 12:00 position. Measures 12" X 5/8". No dents, damage or repairs. Original patina! 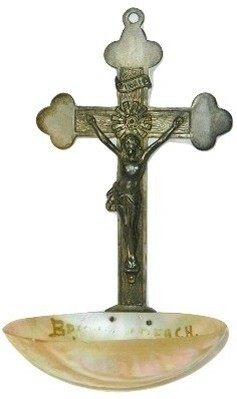 Antique silvered metal and Abaloni shell Crucifix Holy Water Font. 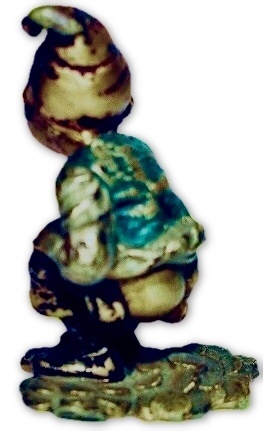 A dark patina is seen on the front of the silvered metal crucifix, and appears to have never been polished. 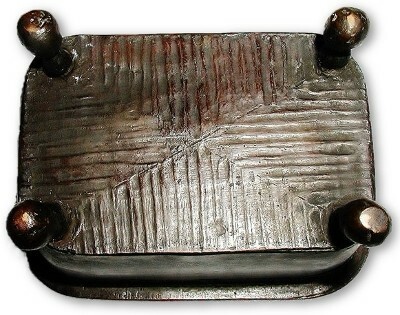 The reverse side shows a shiny, more silver plated finish since that side would have not exposed to the decades of elements. 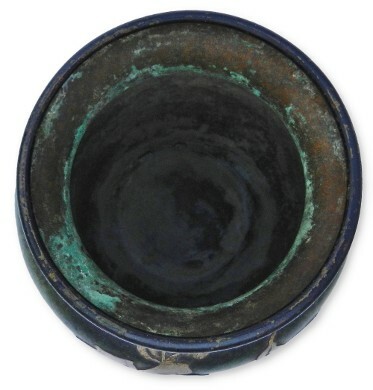 The Holy Water Font has the remnants of the words Brighton Beach enameled in gold. 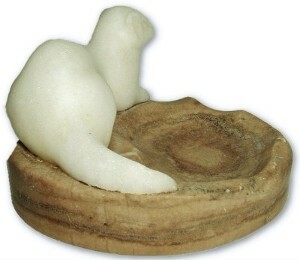 There are a few small flakes along the edge which may have come from the original carving of the shell. Measures 6 1/4" X 3 7/8" X 2 1/2".